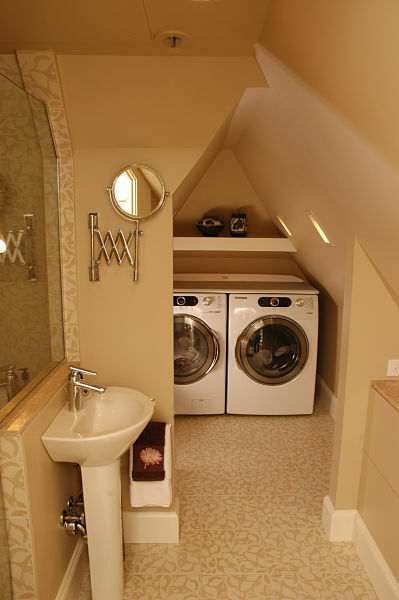 Laundry is one of the essential chores we all do and a well-designed laundry room is an asset in any home. Many of us have lived in homes where the washer and dryer were placed in a basement near a utility tub. Basements really were the perfect spot to hook up a washer and dryer because of the mechanicals – outlets, plumbing and gas lines – located there and the fact that if a hose leaked or water spilled it could be contained and easily cleaned up. Plus, the noise of the machines could be muffled and dirty clothes were out of sight. 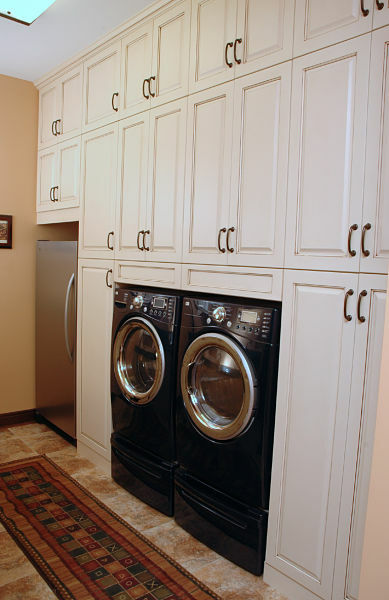 When planning your laundry space, consider the dimensions of the washer and dryer. Typically, front-load washers and dryers are 36 inches high, 24-28 inches wide and about 26 inches deep. You can place them side-by-side or stack them. Stacked machines are about 72-75 inches tall. Top-load washers require about 42 or more inches of vertical space. If you are considering installing a laundry room near bedrooms, a kitchen or other rooms where there is a lot of activity, think about the noise washers and dryers make. If you can’t find sufficiently quiet machines, you may want to discuss options for noise insulation with a contractor before purchasing and installing the appliances. Once you’ve decided where to install a washer and dryer, the next question to ask yourself is – can they be hooked up in that space? You will need plumbing for the washer, ventilation for the dryer and electrical outlets for both machines. You may also need a gas line if you plan to use a gas-fueled dryer. If you are converting a space without these mechanicals into a laundry room, definitely consult with a professional contractor to get an idea about the costs and feasibility of installing the appliances. There are many products to choose from and you may want to do some homework online before buying a washer or dryer. Be sure to note the basics – size, capacity, price and color. But also consider noise and vibration. A washing machine that spins faster than 1,000 rpm will be noisy. Machines also come with accessories including stacking kits and base pedestals and storage units. Before you purchase appliances, read product reviews. They may be one of your best resources, since machines are not hooked up in showrooms. 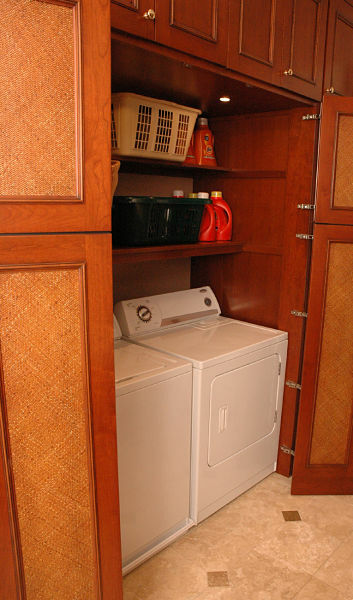 Storage options depend on the space available in the laundry area. If you are placing the washer and dryer in a closet, minimally you will want to have a shelf for storing detergents and fabric softener and a rod for hanging clothes. There are collapsible rods that can work in small spaces and all kinds of organizers and shelf systems to fit your space. Also, look for storage accessories when you purchase the machines, you may find drawers and matching storage units. If you have a larger space and want to install cabinets, think about cabinet configurations for the room as if you were planning a kitchen: galley, L-shaped or U-shaped. If you add a sink, there may be room for under cabinet storage. Installing a front-load washer and dryer side-by-side will provide space for a counter over the machines to serve as a work area and place for storing laundry baskets and supplies. No matter where you place your washer and dryer, the floor underneath should be water resistant in the event of a spill or leak. Consider non-slip tile, vinyl, linoleum or wood flooring in your plans. Task lighting is important in a laundry room. Add outlets and switches in your plan for task lights. Fluorescent and LED fixtures work well under cabinets. Washers and dryers also come equipped with lights to help you see items you are unloading, especially socks that stick to the side of a washer or hide in the back of a dryer.